Phosphatidylserine (PS) is a natural phospholipid and is a component of cell membranes. 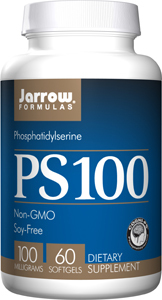 * Jarrow Formulas® Cogni-PS® is a concentrated form of phosphatidylserine from sunflowers that offers superior stability. It does not contain soy and is not derived from genetically modified organisms (non-GMO). Phosphatidylserine is shown in research studies to lower the stress hormone, cortisol. Sharp-PS® is a registered trademark of Enzymotec Ltd. Manufactured and protected under U.S. Patent #8,324,187. Take 1 softgel up to 3 times per day with a meal or as directed by your qualified healthcare professional. Best kept refrigerated. For improved sleep, take 2 capsules one hour before bed without food. Medium chain triglycerides and silica. Softgel consists of gelatin, glycerin and purified water. No wheat, no gluten, no soybeans, no dairy, no egg, no fish/shellfish, no peanuts/tree nuts, no GMOs.